You get the trademark ThinkPad traits, but not much else. Should you buy the Lenovo ThinkPad L480? The Lenovo ThinkPad L480 grants you basic membership in the ThinkPad club. Even if you can’t afford the premium Lenovo charges for its slimmer, more powerful models like the ThinkPad X1 Carbon (6th Gen), you’re at least getting a stellar keyboard and sturdy construction. The ThinkPad L480 offers generous connectivity, and decent performance and battery life. Underneath, Lenovo’s no-nonsense Vantage software keeps everything humming. 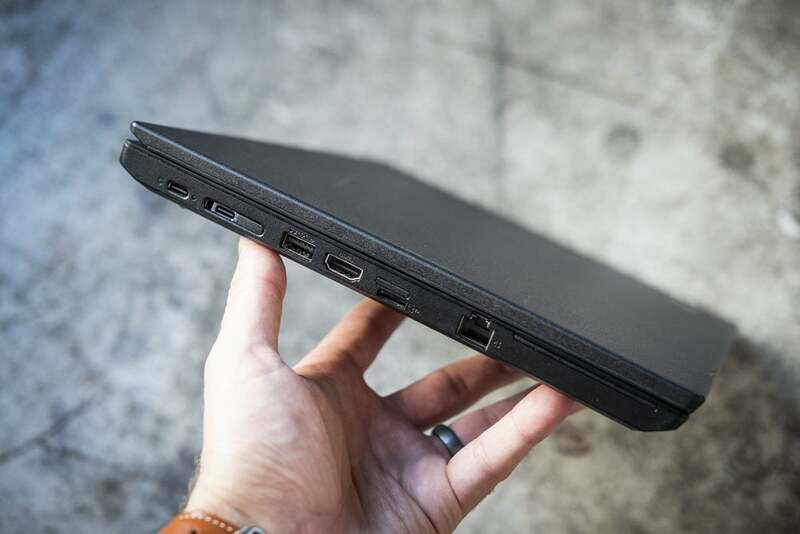 But this entry-level business laptop doesn’t offer that much more, and you may start to wonder if Lenovo cut one corner too many on the display. Let’s start with a rundown of the ThinkPad L480’s specs, focusing on our review unit but noting other options where available. When it comes to pricing, the ThinkPad L480 we reviewed is a bit of a moving target. Lenovo was running an $895 “web discount” for the L480 when we began the review, but the price rose to more than $1,000 by the time the review posted. The generous complement of ports is worth noting because it’ll likely save you from hauling additional dongles—and that’s worth something. But Lenovo also held back in a few places: There’s an Ethernet Gen 2 jack that’s been sealed off, preventing it from being used with Lenovo’s 90W Pro Dock. Likewise, Lenovo included an WWAN slot for a SIM chip, but that’s been blocked off. 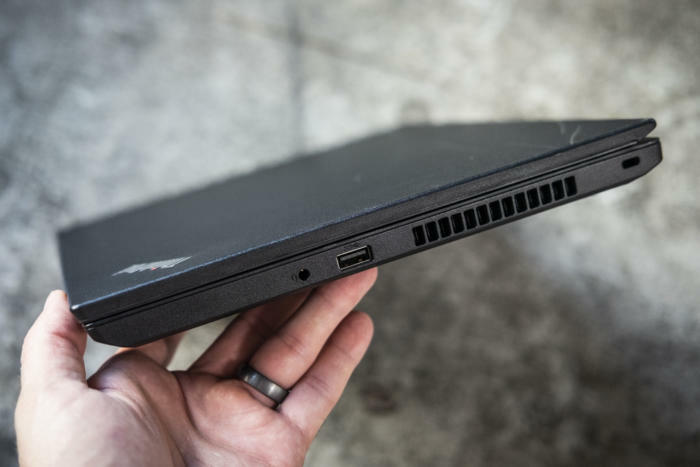 There’s a wealth of ports on the Lenovo ThinkPad L480. While the L480’s thickness allows room for all those ports, it also makes the laptop feel a bit dated. At 4.22 pounds for the notebook and charger, the additional weight is noticeable, though not uncomfortable; that and the form factor probably necessitates some sort of backpack. On the plus side, the L480 is sturdily made, with nary a wobble to be found. It’s MIL-STD 810G certified for ruggedness. There is a bit of flex in the center of the keyboard that reveals itself with a pronounced push, but it doesn’t affect typing. Lenovo bundles a one-year depot warranty with the L480; drop/spill/electrical protection is a $33.15 additional cost. The thicker notebook construction allows for robust side-mounted cooling. It was a bit of a shock to receive a laptop without a touchscreen, though touch is obviously not required to use Windows. You do have the option to buy a touch-enabled L480 from Lenovo, but not apparently as an optional upgrade; instead, you’ll need to purchase a dedicated higher-end configuration that’s $300 more at this writing. That’s annoying, and a ton of cash to fork over for just a touchscreen. The L480’s display is a low point. It puts out an anemic 196 nits, far less than the 260 we consider comfortable for our battery rundown test. That makes the L480 comfortable to use indoors, but natural light will quickly wash out the L480’s display. Even worse, the default setting was 40 hertz, instead of a comfortable 60Hz refresh rate. ThinkPad keyboards favor broad, spacious landing pads for your fingers, and a comfortable amount of key travel. They are excellent, and the L480 offers more of the same. When comparing the recent ThinkPad X1 Carbon (6th Gen) to the L480, the L480 felt a bit less resilient, but not unpleasantly so. 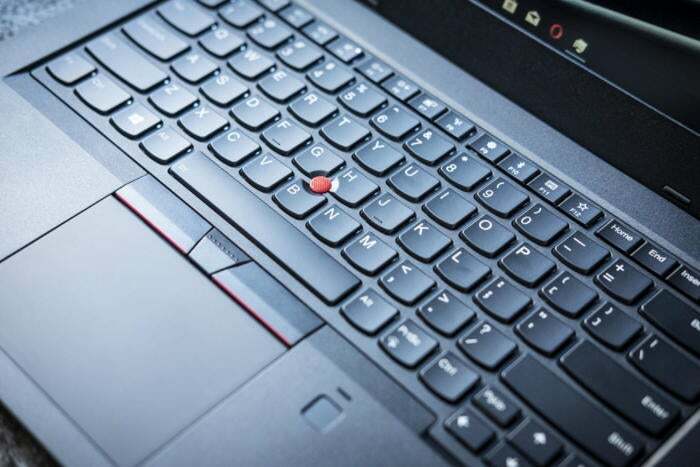 The L480 includes the iconic red Trackpoint amidst the keys, and dedicated mouse buttons above the trackpad. Lenovo dedicated a generous 4 x 2.75 inches of space to the L480’s trackpad, making it one of the largest we’ve seen. It does feel a bit more plasticky than others in the ThinkPad line, though, and was responsive only across its lower half. If you’re looking for areas where Lenovo cut corners, here’s another. This should be a familiar keyboard layout for ThinkPad owners. Note the large trackpad. As an inexpensive business laptop, don’t expect much to come out of the L480’s two bottom-firing speakers. The low end is quite muddy, and the highs aren’t much to speak of, either. Plugging in headphones alleviates much of the this, though I wasn’t as impressed as I sometimes am with the difference in audio quality. Dolby Audio can be enabled, however, which mitigates some of the deficiencies. 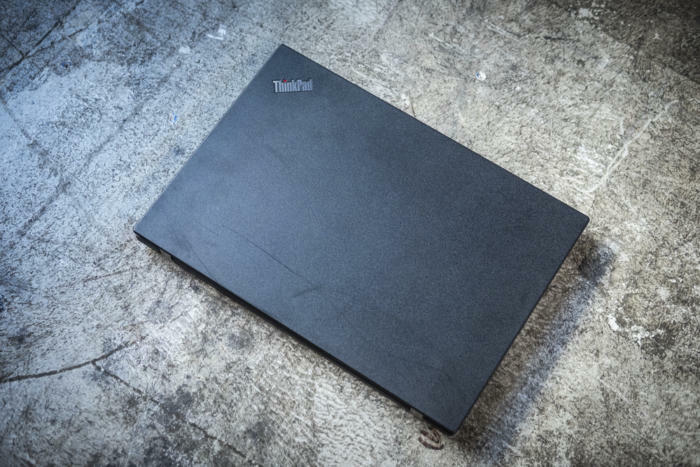 It seemed to take slightly longer to log in using the fingerprint sensor than on other ThinkPad models, but the recognition was flawless during our review period. Speaking of cameras, what the L480 offers is a decent HD front-facing camera, without the privacy-minded ThinkShutter found on the X1 Carbon. (That allows you to manually slide a shutter over the camera, as a way to stop suspected hackers from spying on you via your webcam.) There’s no Windows Hello option for the front-facing camera, and no rear camera, either. The included Vantage software does a nifty job of managing upgrades for the L480, and can serve to configure the L480 as you’d like it. 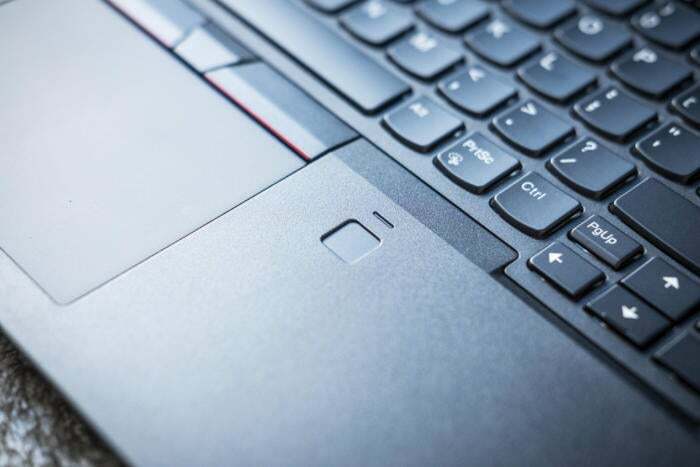 A seemingly perpetual ThinkPad quirk involves swapping the Function and Control keys at the bottom left, which you can swap back using the Vantage software. As with many other ThinkPads, the L480 supports USB-C charging, using what appears to be the same 65-watt charger as other ThinkPads that Lenovo sells. 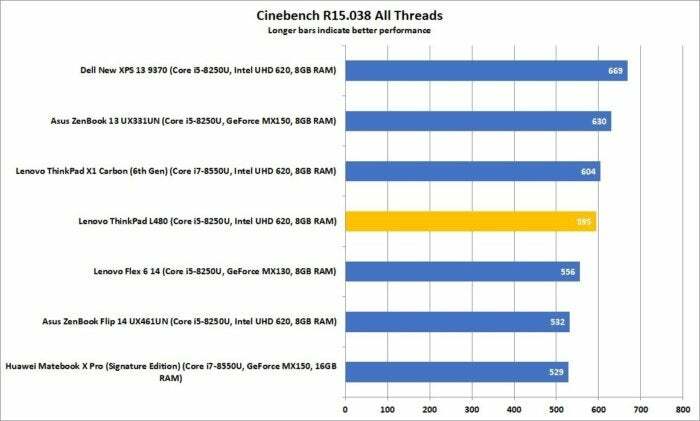 When it comes to performance, you probably don’t have to worry about whether an 8th-gen chip such as the Kaby Lake-R processor powering the L480 can power basic tasks. As a business notebook, the L480 handled typical office tasks, web browsing, and the like quite adequately. The base allotment of 8GB of memory is more than adequate. The only performance issue I noted was a period of non-responsiveness to functions like search, when I had just signed in to multiple cloud services such as OneDrive and OneNote, which were trying to sync gigabytes of accumulated data at once. Anything beyond sprite-based games or simple platformers will tax the system, but that’s not why you buy the L480, anyway. With a basic business notebook like the ThinkPad L480, we address the performance question pretty simply. 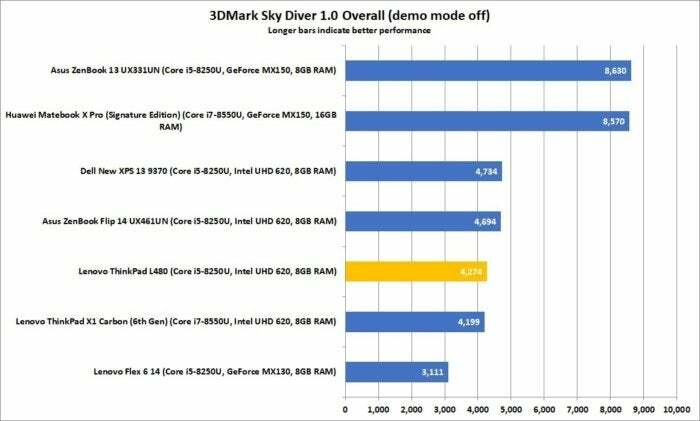 CPU performance is the priority, and many laptops (including the L480) have integrated graphics rather than discrete GPUs. We compared it to a group of 13-inch and 14-inch laptops with similarities in CPU, GPU, or price. PCMark’s trio of tests, including Work, Home, and Creative, measure how the L480 and notebooks like it will fare in everyday applications. The Work test uses spreadsheets and word processing to evaluate how the laptop will fare during the course of business. 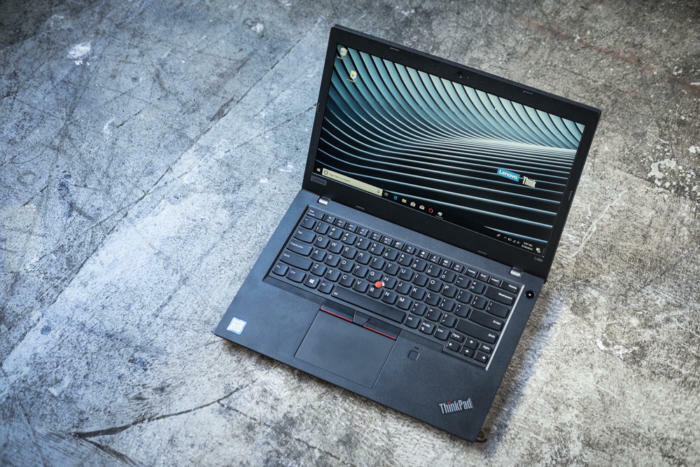 You should have no qualms about using the ThinkPad L480 here, and the 8GB of memory provides a comfortable cushion of memory for large spreadsheets or numerous tabs. Though the L480 finishes near the bottom of our list of laptops, the grouping is pretty tight. 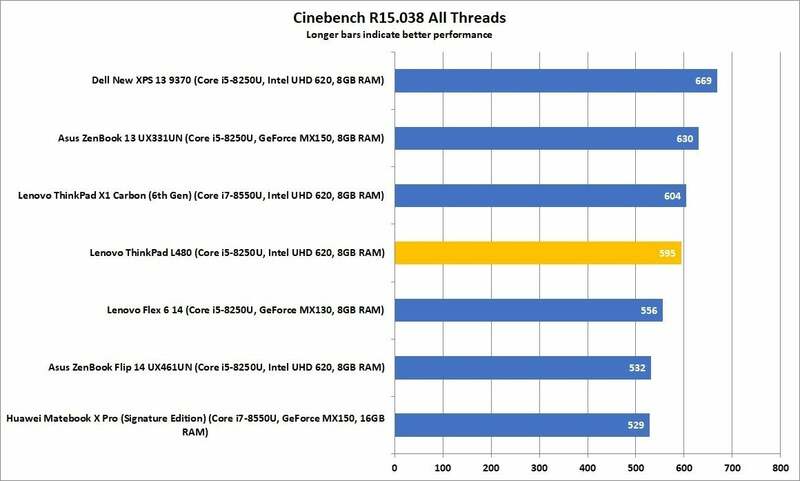 Cinebench, by Maxon, renders a scene using all four cores and eight threads, giving it a healthy advantage over CPUs that lack HyperThreading. 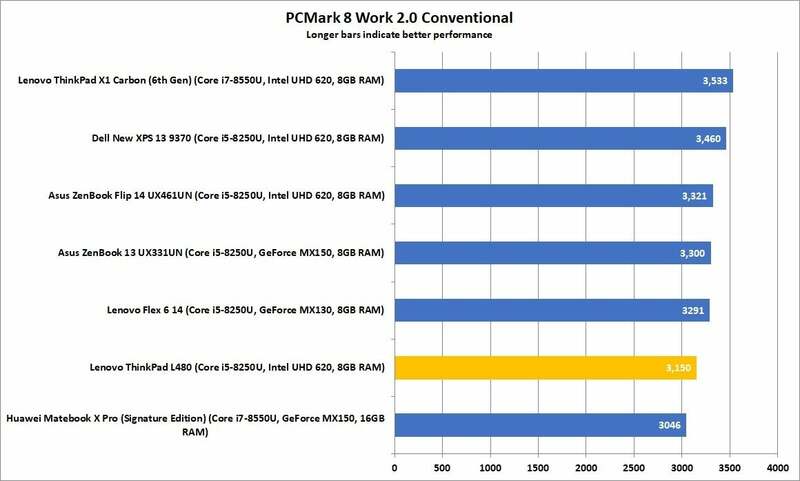 The L480 chews through the rendering test at a healthy pace, a good sign that that it can handle similar workloads in the real world. 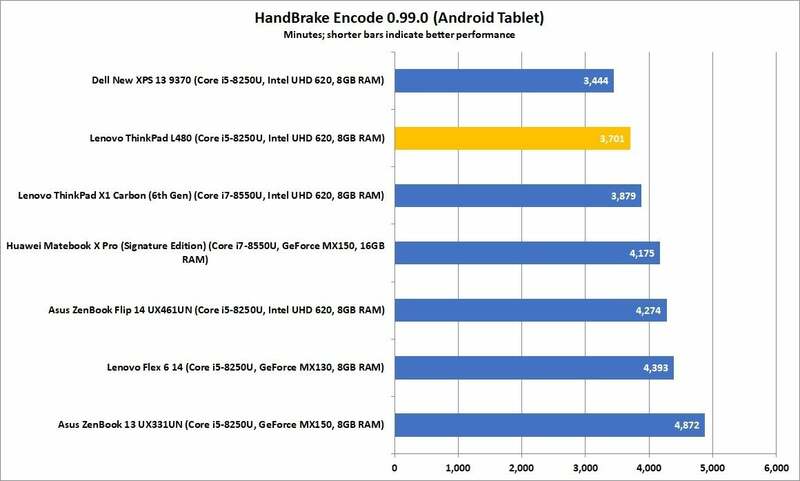 Again, another tight grouping of benchmark scores, with the Lenovo L480 finishing in the middle of the pack. HandBrake, too, stresses the CPU. This open-source transcoding tool is best thought of as a prolonged stress test on the system, as it takes an MKV movie file and converts it into a format that’s suited for watching on an Android tablet on a plane. 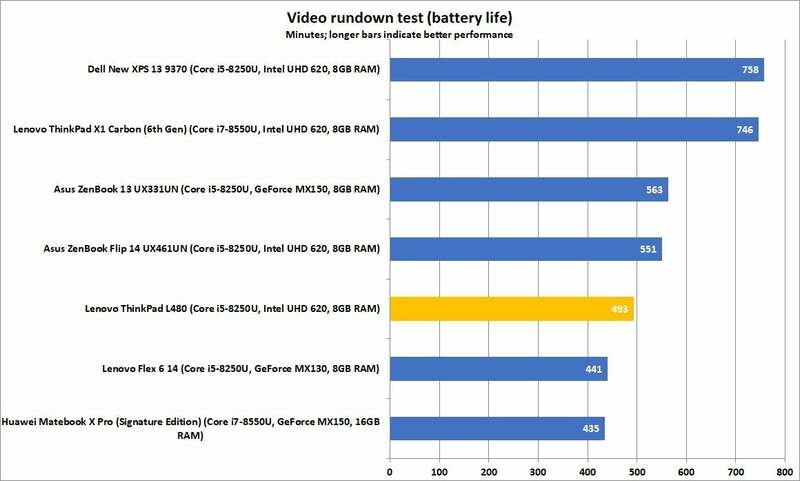 Though we use this as a comparative test, the fact that the L480 completes its task in about an hour—less than the 90 minutes or so the movie requires to watch—indicates that transcoding is a practical task to assign to the L480. Lenovo’s L480 does rather well in our prolonged HandBrake conversion test. Any laptop with a discrete GPU will blow away the Lenovo L480, as occurs here. Battery life is the other measure of a notebook, especially a business machine that you can take on the road. While the L480 doesn’t do that well, comparatively, you’re getting a decent eight hours of battery life. The relatively low light output from the L480’s screen probably helps. It’s here that we were hoping that the Lenovo L480 would do better, since the larger notebook form factor could accommodate a larger battery. Lenovo’s L480 offers basic competency for business users, and there’s nothing intrinsically wrong with that. But the trade-offs the Lenovo made are tough ones. The screen is mediocre, even before you factor in the lack of touch—and the heavy premium Lenovo charges if you want that capability. Middling battery life and multimedia features don’t do much to redeem it, though the typically excellent keyboard makes it a pleasure to type upon. In general, Lenovo’s ThinkPad L480 feels like the business notebook your IT department saddles you with for work, and what you gratefully set aside in the evening for a more comfortable computing experience. While it’s competent, you may be better served by looking at some of the other notebooks we’ve compared it to. Lenovo's ThinkPad L480 is the entry-level member of the Thinkpad club of business notebooks, but its excellent keyboard can't redeem a mediocre display and performance.